First, I normally would pass on such an investment - but given the recent volatility in the stock market and current low prices/interest rates in real estate (soon to go up) - I noticed that distressed properties have begun to show a silver lining. While researching the state of the economy and other demographic trends - I think that distressed properties are a potential "home-run"... mostly for their income potential. Why? Well, I'll show you an example of a property I hope to purchase. The rental income above is estimated based on the area's fair market rent - because my monthly net income is so high, I could lower the rent below the fair market rate if needed and still make a hefty profit after paying the mortgage. I don't have the experience nor the time to manage the property myself, which is why I'd rather leave the maintenance, leasing, tenant background check, etc. up to a reputable property management company that will do all of this for me (for a small fee of course - not included is the one time $250 acquisition fee). 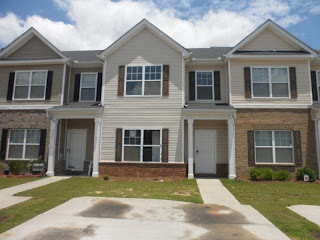 With these types of returns - distressed properties don't look so bad...especially when they are relatively new (this one is built in 2008) and in functioning neighborhoods ( I don't want to be a slumlord!). I'm willing to take on this type of risk because of the cash flow potential and limited downside. If I can't get someone to rent it out - then I'm stuck paying the mortgage. But this is what the property mgmt company is for - they specialize in getting tenants into homes. Finally, this property will prove to be an even better investment once I include my tax depreciation, interest deduction, and expense write-offs. It's probably better to take this risk versus getting myself locked into another car note and paying a dealership for the next 5 yrs. Just my thoughts. I have a question, Barrington. I saw some pretty interesting lands at really cheap prices in Detroit. I understand the current economic crisis - however, do you believe that buying low could be beneficial in the near future? Yes buying low can be beneficial long term! One would understandably need to be patient until the market fully recovers and to realize any potential profit.